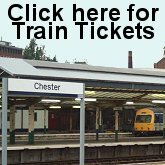 Need help finding hotels in Chester? Alternatively, complete the form below and Hotels Of Chester will answer your enquiry as soon as possible by e-mail. How much, approximately, do you want to spend per room, per night? After you send this form, Hotels Of Chester will reply to you by e-mail with suggestions. All pages within the HotelsOfLiverpool.com and HotelsOfLiverpool.co.uk websites are Copyright © 2002-08 HotelsForEurope.com. All rights reserved. If you wish to reproduce any content please contact us first for permission - We don't bite!